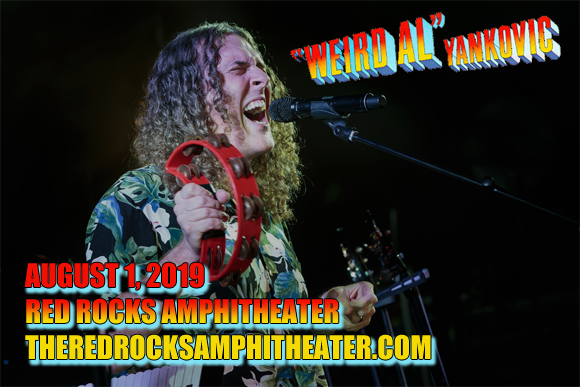 Just when you thought he couldn't get any more in-your-face, the phenomenal king of the parody, Weird Al Yankovic comes to Red Rocks Amphitheater on Thursday 1st August 2019 with the backing of a full symphony orchestra! Expect props and costumes galore, and the most exciting production you've ever seen from a Weird Al show, as he performs his biggest hits as part of the Strings Attached Tour! It's going to be one wild night of singalong fun! American comic singer-songwriter, film/record producer, satirist, and author "Weird Al" Yankovic first found fame in the 1980s when his parodies of popular songs and their accompanying music videos became hits on MTV. His first major single was a parody of Michael Jackson's "Beat It", entitled "Eat It", released in 1984. Yankovic's skill with recreating music videos, often scene-for-scene, led to him working with several other artists, directing videos for the likes of Ben Folds, Hanson, The Black Crowes, and The Presidents of the United States of America. Yankovic's popularity continued into the 1990s, with singles like "Smells Like Nirvana" (a takeoff of Nirvana's "Smells Like Teen Spirit") and "Amish Paradise" (a takeoff of Coolio's "Gangsta's Paradise"). To date, Yankovic has written over 150 parody and original songs and has sold more than 12 million albums. 2006 saw two firsts for Yankovic: his first top ten song with "White & Nerdy", and his first top ten album with Straight Outta Lynwood. His first number-one album, and most recent release, was 2014's Mandatory Fun.